The Contour Hint point is used on the colour fill zone and brush lines; in other words, on Contour vectors. It allows the control of line thickness and contour position. Also, if a contour is not animated the way that it should be you can use hints to correct the animation. For example, if a flag is not waving properly. When adding a Contour Hint point, make sure that you place it far enough away from the contour so that you can see it snap to the contour. The Contour Hint points are yellow. Do not place the Contour Hint directly on the line as it may look like it has snapped to the contour, when in fact, it has not and the morphing will remain unchanged. To correct a brush stroke, place a hint on both sides of the line to indicate its thickness variations over time. The Zone Hint point is used on a colour zone to control the proximity rule. The Zone Hint is placed in the centre of the colour zone. Sometimes a colour zone is not associated with the corresponding one by default. For example, in a splash animation there are many water droplets that are the same colour. The system automatically morphs the droplet to the nearest one. This is not always correct. A Zone Hint will force a colour zone to morph with another one. Zone Hint points are cyan in colour so you can easily see them. A Pencil Hint point is used to control a pencil line, also known as central vector. It can be used on drawings that were done using the Pencil, Polyline, Ellipse, Line and Rectangle tools. Like the Contour Hint, the Pencil Hint snaps to the central vector. Make sure to place it far enough away from the line so you will see it snap when you move it. Pencil Hint points are magenta in colour so you can easily see them. A Vanishing Point Hint is used to control the trajectory of a vanishing shape. A shape will vanish from the source drawing when there is no corresponding shape in the destination drawing. If you do not place a Vanishing Hint to control the point of disappearance, the shape will vanish into its centre. Vanishing Point Hint points are green in colour so you can easily see them. An Appearing Point Hint is used to control the trajectory of an appearing shape. 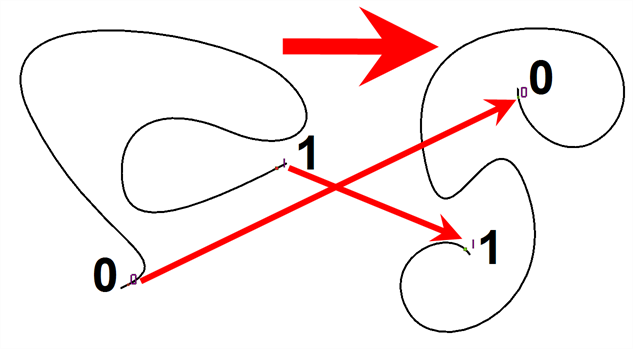 A shape will appear in the destination drawing when there is no corresponding shape in the source drawing. If you do not place an Appearing Point Hint to control the point of appearance, the shape will appear from its centre and expand outwards. Appearing Point Hint points are violet in colour so you can easily see them.